An interesting window on the Neanderthal life way. They obviously made tea. This meant a clay line hole in the ground at least when no pottery was available or more likely a clay lined wooden bucket. I suspect that the water was heated with hot rocks handled using wads of fresh moss and that is the best explanation for the presence of moss at all. A little moss left in the stew or beverage would not be a problem. It appears they were as adept as most hunter gatherers. A Neanderthal model on display at the Natural History Museum The Natural History Museum, London Despite their popular reputation as meat-eating simpletons, some Neanderthals ate a vegetarian diet and appear to have used natural forms of penicillin and aspirin to treat infections and pain. Dental plaque was found on the fossilised teeth of Neanderthals who lived in what is now Asturias, Spain, and in Belgium up to 50,000 years ago. In a startling demonstration of just how astonishing science can be, a team of researchers from Spain, Australia and the UK were able to extract DNA from the plaque that allowed them to tell what the individuals had eaten. Neanderthals were thought to be enthusiastic meat eaters and an analysis of the remains found in Belgium revealed DNA from woolly rhinoceroses and wild sheep, along with a few mushrooms. But the teeth of the Spanish group revealed they had eaten wild mushrooms, pine nuts and moss, but no evidence of meat, according to a paper in the journal Nature. 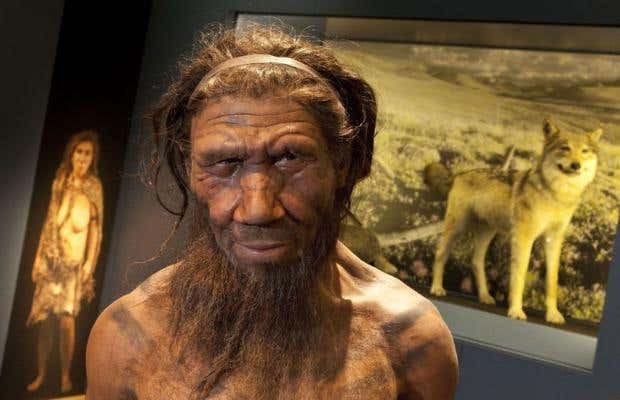 One of the researchers, Dr Antonio Rosas, of Spain’s National Natural Science Museum, said: “We were surprised not to find any remains of meat in the Asturias Neanderthals, given that they were thought to be predominantly meat eaters. “However, we have found evidence they enjoyed a varied diet including a wide range of plants. The enamel and dentine of one Neanderthal’s upper teeth were chipped, and it is thought he may have used his like a third hand when sharpening stone tools. But there were also signs that he was in severe pain and had taken surprising advanced steps to alleviate it. Dr Rosas said: "We have evidence that this Neanderthal self-medicated. “We have discovered that the plaque preserved in his teeth contains sequences of the pathogen Enterocytozoon bieneusi, which causes gastrointestinal problems, including serious diarrhoea. The plaque contained traces of the penicillium fungus, the natural antibiotic from which the drug penicillin is derived, and also poplar. That tree’s bark, roots and leaves all contain salicylic acid, which is used in aspirin and other painkillers. Professor Alan Cooper, of the Australian Centre for Ancient DNA at Adelaide University, who helped carry out the genetic analysis, said the evidence showed Neanderthals were more sophisticated than previously thought. “Apparently, Neandertals possessed a good knowledge of medicinal plants and their various anti-inflammatory and pain-relieving properties, and seem to be self-medicating,” he said. “The use of antibiotics would be very surprising, as this is more than 40,000 years before we developed penicillin. Researchers have previously found evidence that Neanderthals were aware some plants had medicinal properties, apparently taking camomile and yarrow to help their digestion. The remains were found in El Sidrón cave in Piloña, northern Spain. Discovered in 1994, the cave is one of the most active archaeological dig sites in the world. So far 2,500 skeletal remains from 13 Neanderthals, male and female, young and old, have been discovered there. Another of the researchers involved in the current study, Professor Keith Dobney, of Liverpool University, said the techniques available to scientists were enabling them to “access direct evidence of what our ancestors were eating”. Do You Have The Stomach For Moss and Lichens? New York Times Wiretap Story.